The NCLBPH What’s New blog gives our patrons a chance to find out the latest happenings, where we’ll be visiting and useful information on technology and resources to make life better. Check back regularly and we’ll have something new for you. 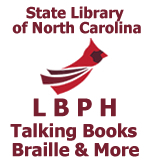 Please note that the information in this blog does not necessarily represent the ideas and opinions of the State Library of North Carolina, the Library for the Blind and Physically Handicapped, or the Department of Cultural Resources. NCLBPH blog administrators have the right to not publish any comment submitted that is considered inappropriate for this resource. If you provide a valid email address when submitting a comment and your comment is considered inappropriate, a staff member will email you with an explanation so you have the opportunity to resubmit it. Your email address will never be published publicly.